1. Connor Ungar, Brandon Wheat Kings: Playing in the third game of his WHL career, Brandon Wheat Kings goaltender Connor Ungar stopped all 34 shots sent his way to secure his first win and shutout on the same night. Ungar stopped 11 shots in the first, three in the second, and 20 in the third for the clean sheet. Ungar also held the Rebels at bay on five power-play opportunities. The Calgary, Alta. product has appeared in three games with the Wheat Kings this season, posting a 1-1-0-0 record, 1.74 goals-against-average, a 0.944 save percentage, and one shutout in 138 minutes of action. 2. Riley Woods, Spokane Chiefs: Spokane Chiefs overage forward Riley Woods recorded the first five-point game of his WHL career Wednesday, picking up a goal and four assists in a 7-2 win against the Portland Winterhawks. Woods opened the scoring with his 25th goal of the season, then added assists on Spokane’s second, fourth, sixth, and seventh goals of the game. The 20-year-old forward has played some of his best hockey against the divisional rival this season, recording 10 points (3G-7A) in four games. The Regina, Sask. product now has 50 points (25G-25A) in 45 games this season and 156 points (71G-85A) in 210 WHL regular season games. 3. James Malm, Calgary Hitmen: Calgary Hitmen forward James Malm recorded his fourth multi-goal game of the season Wednesday as part of a three-point game in a 6-2 road win against the Swift Current Broncos. Malm scored the third and fifth goals of the game for the Hitmen, adding the lone assist on the team’s second goal. The Langley, B.C. product has 49 points (20G-29A) in 44 games this season and 168 points (59G-109A) in 210 WHL regular season games. 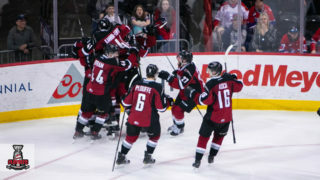 The Calgary Hitmen extended their winning streak to four games Wednesday, displaying another offensive showcase in a 6-2 win against the Swift Current Broncos. James Malm had his fourth multi-goal game this season while adding an assist for the three-point night. Between the pipes, Brayden Peters stopped 30 of 32 shots in his WHL debut, marking the first victory of his WHL career. Exploding out of the gate for four goals in the first period, the Hitmen took charge early as Cael Zimmerman, Layne Toder, James Malm, and Luke Coleman found the back of the net. The Broncos responded with a lone goal from Ethan O’Rourke to trail 4-1 after 20 minutes. In the second, the Broncos got another goal back, this time from the stick of Ian Briscoe, but it wouldn’t be enough as third-period goals from Malm and Kaden Elder rounded out the scoring. Through it all, Peters was there to deny the Broncos at almost every opportunity, stopping six shots in the first, 14 in the second, and 10 in the third for the victory. In addition to Elder’s goal in his return to Swift Current, former Bronco Riley Stotts (Toronto Maple Leafs) had a pair of assists. 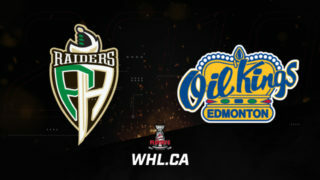 The Brandon Wheat Kings put together a solid 60-minute effort Wednesday, silencing the Red Deer Rebels with a 4-0 win. Connor Ungar stopped all 34 shots sent his way for the first win of his WHL career and the first shutout as well. On the offensive side of the puck, the first-career goal from Brandonite Ty Thorpe stood up as the game-winning goal in the contest. Thorpe’s goal was the only one through 20 minutes and Braden Schneider doubled the Wheaties’ lead in the second. In the third, goals from 2019 NHL Draft prospect Luka Burzan and an empty-net strike from long range by Caiden Daley closed out the contest. Brandon Hagel (Chicago Blackhawks) led the Rebels with six shots while 2019 NHL draft prospect Ethan Anders stopped 25 of 28 shots in the loss. 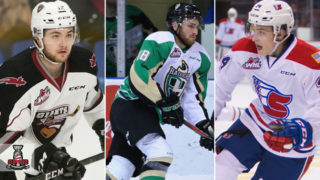 2019 NHL Draft prospect Bowen Byram factored into another win for the Vancouver Giants Wednesday. Stop us if you’ve heard this one before. 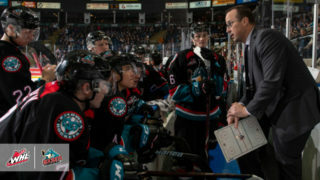 Byram scored his 19th goal of the season 33 seconds into overtime as the Giants escaped from the Sandman Centre with a 3-2 overtime victory against the Kamloops Blazers after leading 2-0 midway through the third. With no goals through 40 minutes, the pressure built up into the third where the Giants were the first to capitalize. Lukas Svejkovsky opened the scoring 1:59 into the final period of regulation, followed 8:32 into the period by Davis Koch’s 20th goal of the season in the 300th game of his WHL career. The Blazers would battle back though as the Marwayne, Alta. connection paid more dividends with Zane Franklin and Orrin Centazzo both finding the back of the net. 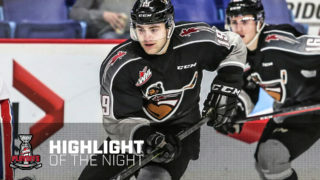 The triumph of forcing overtime would be short-lived though as Byram notched his fifth game-winning goal of the season early on into the extra period. 2019 NHL Draft prospect Trent Miner earned the victory, stopping 29 of 31 shots. Dylan Ferguson (Vegas Golden Knights) stopped 18 shots in the one-goal loss. 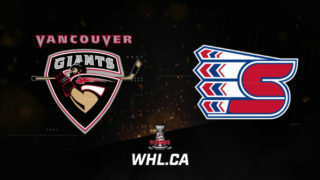 Giants captain Jared Dmytriw had a pair of helpers in the contest while Franklin added an assist to his goal for the Blazers’ lone multi-point game of the evening. Henrik Rybinski’s first goal with the Seattle Thunderbirds was a big one as the 2019 NHL Draft prospect scored 2:38 into overtime Wednesday, lifting the Thunderbirds to a 3-2 win against the Kelowna Rockets. Mark Liwiski and Matthew Wedman traded goals in the opening period to keep the teams tied after 20 minutes. The score remained deadlocked through 40 minutes as a short-handed goal from Kyle Crosbie and Tyrel Bauer’s second of the season kept the game at a 2-2 draw. The goaltenders took over in the third to keep things tied until Rybinski’s game-winning goal in the extra frame. Roddy Ross stopped 26 of 28 shots to earn the victory while 2019 NHL Draft prospect Roman Basran stopped 35 shots in the narrow loss. A five-point game from Riley Woods, as well as three-point performances by co-captain Jaret Anderson-Dolan (Los Angeles Kings) and Luc Smith led the Spokane Chiefs to a 7-2 rout of the Portland Winterhawks Wednesday night. Smith had a pair of goals while Anderson-Dolan had a single tally in the large victory as the Chiefs snapped a seven-game losing streak. Tied 1-1 through 20 minutes, the Chiefs tallied three goals in each of the second and third periods. Jake McGrew (San Jose Sharks), Ethan McIndoe, and Jack Finley also scored in the win for the Chiefs. Co-captain Ty Smith (New Jersey Devils) had a pair of assists in the victory. Bailey Brkin stopped 19 of 21 shots for the win. Lane Gilliss and Josh Paterson had the goals for Portland in the loss.